Neil Redfearn, set to return to Elland Road as Rotherham United manager. Interesting personal battles and equally interesting role reversals are on the cards at Elland Road on Saturday when Leeds United return to action against Rotherham United. In many ways there will be just as many eyes on the dug-outs as on the field with the men in charge having effectively swapped places. When the two Yorkshire teams last met in the final game of last season in May, it was Neil Redfearn in the Leeds hot seat and Steve Evans in charge of Rotherham, but they will both be desperate for very different results this time. Both will be hoping to put their expertise on their opposing players to full use and both are certainly in need of a result, Evans to maintain the improvement in Leeds’ form after victories in their last two league games and the friendly at Wycombe and Redfearn to kick start his spell as Rotherham boss after a tricky start that sees the Millers come to Elland Road rock bottom. Without a win so far, how ironic would it be if Redfearn’s first victory was to come at the ground where many believe he should still be the home head coach? 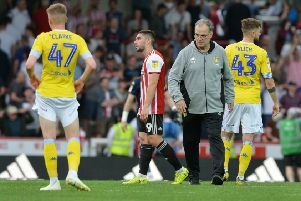 Whatever the result, Redfearn is assured of a warm welcome back from the Leeds fans, who appreciate what he did for the club in helping them out of a hole last season and for the way he has helped in the development of the current crop of talented youngsters at the club. Many supporters still feel aggrieved on his part for the way he was dealt with by owner Massimo Cellino in the summer and it will not surprise anyone if he gets a bigger reception than the man now given the task of reviving Leeds’ fortunes. Evans, who is winning Leeds fans over after by his own admission not being their number one choice, meanwhile, ought to get a great reception from the Rotherham fans after the great job he did there, lifting them up two divisions and then keeping them in the Championship last term. Personal rivalries aside, it is an important game in many other ways as Leeds look for a win that can shoot them up the table and ease worries about getting dragged into a relegation scrap. They would also like to improve a record that has only seen them be on the winning side against Rotherham once in seven meetings since 1982. Evans was given food for thought by the display and a 2-0 win at Wycombe in the friendly he arranged last Friday, but he is likely to stick to the team that got him the points against Cardiff and at Huddersfield so long as his international players report back 100 per cent. His biggest call is whether to retain Liam Cooper after he had to be substituted early at Huddersfield because of concussion. Sol Bamba had been left on the bench, but ended up playing most of the game and the side kept a clean sheet, as they did at Wycombe when Bamba and Giuseppe Bellusci were central defensive partners again. Cooper is likely to be fit again to face Rotherham, but Evans has already indicated that the player in possession of the first team spot gets to keep it if he does well enough in his eyes. That may mean Scott Wootton staying at right-back, although Sam Byram did his chances of a recall no harm with a goalscoring second half display at Wycombe.